Strung up, the austerity piñata seemed loomed large, menacing yet festive. A handmade pair of red scissors so large it barely fit into the back seat of a car. I wondered how it wound up being incorporated into our 2015 AGM, this activity normally reserved for birthday parties and other celebrations. It began to feel more poignant when I started facilitating a discussion with representatives of 5-6 community groups about financial stability. 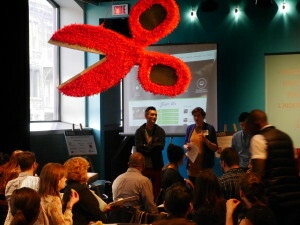 People were describing how money impacts community work, and their sense of well-being. Within the context of this conversation, the piñata became pertinent – ready to snip at any moment, threatening to change everything. This is the moment we find ourselves in these days – the moment before the potential cut, of uncertainty. For many of those around us, austerity – the word used as a catch-all for the things we can’t believe are happening – is leaving us in a state of inertia and fragility. Towards the end of the night, we picked up a broomstick and began whacking. The energy in the air shifted to gleeful anticipation. Only 3 people made contact with the piñata, but each of the 50 people in the room was connected to the act. A sense of relief and huge bouts of laughter permeated through the space as the red scissors fell in a cloud of red confetti. A sense of closeness and release could be felt in the group as we relished the irony of the fact that there really wasn’t much candy inside. We mused afterwards for days about why that darn piñata had become such an essential part of the event. The answer was in the act itself: instead of furrowed brows and serious conversations, we had done what we so often forget to do together – play, have fun, and be creative, especially when faced with what stresses us out. How can we as community groups remember the essence of play, something so vital for our well-being and health? We’d love to hear from you all the ways in which you are staying creative in these difficult times. Click here to see some photos from our most recent AGM.